The Carters: Peace, Love, Smoke.......????? 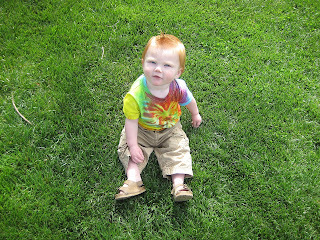 I love tie die shirts and Birkenstock does that make me a hippie? Yes, it most definitely does. Lani! I totally thought of you when we were driving to Reno and I saw a sign that said Sacramento 159 miles or whatever. I didn't realize we were that close! 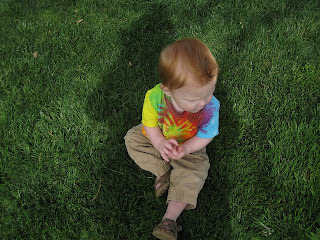 It is so weird to see landon sitting on green grass! We had a little snow yesterday so it makes me excited for us to have that kind of weather. So what a stinkin cute kid! I miss you Lani! I haven't seen you in way too long. I don;t even know when I will be home next. I sure don't make it out there much. you sure do have a cute family!